EGLIN AFB, Fla. --- As Hurricane Michael churned toward the Emerald Coast of Florida, F-35A Lightning IIs from the 33rd Fighter Wing evacuated to Barksdale Air Force Base, Louisiana, to avoid the storm’s path and potential catastrophic damage. As Michael passed, narrowly missing Eglin AFB, a different type of storm brewed on the horizon that would test nomad innovation. There was talk within the F-35 community of a one-time inspection, or OTI, order being passed down. Every aircraft at the 33rd FW needed to have a fuel line on the engine inspected. Parts within a specific batch number needed to be removed and replaced. All of the wing’s aircraft were grounded until they were inspected and fixed if needed. This had a profound impact back at Eglin AFB but brought even more complications for the aircraft still at Barksdale AFB. The current guidelines used for aircraft maintenance required that the entire engine be removed, which would require at least 36 hours per jet. (Emphasis added—Ed.) Furthermore, engine trailers and tool boxes would need to be transported to the location, extending the timeline. When the OTI was made official on Oct. 12, leadership at all levels of the 33rd Maintenance Group and 33rd Aircraft Maintenance Squadron saw an opportunity for Airmen to demonstrate how capable they are. They extended a challenge…find a better way. The maintainers at Barksdale AFB determined eight of the jets failed the requirements of the OTI. The remaining jets returned to Eglin AFB. Maintainers working with field support engineers from Lockheed Martin and Pratt and Whitney set out to find a way to replace the fuel line without removing the engine. Crew chiefs determined they could access the part through a hole just big enough to fit a hand. The location of the fuel line is nearly impossible to see. They needed to detach and set aside another component without removing it, making room even scarcer. Despite how difficult it was, they succeeded in finding the fix. The first across the F-35’s global presence. Within three days of the official notification, the 58th AMU had identified the jets that were deficient, found the fix, got it reviewed and approved to execute and were on their way to Barksdale AFB to implement the new procedure. Every training mission requires teamwork between countless organizations to prepare jets for flight and get them in the air. The actions that took place following the OTI highlighted the significance and effectiveness of the many organizations working together within the 33rd MXG. At the group level, the plans and scheduling section ordered new parts and opened lines of communication with leadership ensuring appropriate communication was taking place. They identified aircraft that were unaffected by the inspection, enabling them to return home earlier. Maintenance was then prioritized across the fleet to enable normal operations at the wing to continue. The quality assurance section helped by validating the new technical data and inspection process. They also sent a member of their team to Barksdale AFB to provide assistance and oversight, eventually streamlining the repairs. Members from the 33rd MXS Low Observable and Fuels sections provided additional maintenance assistance and augmented the initial group of maintainers that deployed to recover the jets. They drove hundreds of miles to deliver support equipment and the required consumables to complete the repair. Their actions shaved days off of delivery times and avoided several thousand dollars in transportation costs. “The F-35 program tends to bring parties together under one common cause, maturing the program,” said Chief Master Sgt. Matthew Coltrin, 33rd MXS superintendent. Coltrin went on to say that their partnership is strong because many of the functions that existed within a traditional maintenance squadron with fourth generation aircraft now lie within the fifth-generation aircraft maintenance squadron. “More now than ever we rely on each other to accomplish organic maintenance. On fifth-gen aircraft it takes a village. No squadron can go it alone,” said Coltrin. To this date, only one other unit has replicated the same maintenance on three jets. This is because of what sets the 33rd FW maintenance team apart from others. When the OTI was first accomplished, the fuel line swap took about 24 hours, 12 hours less than removing the entire engine and performing the maintenance on a stand. As they repeated the task on additional aircraft, they were able to shave another four hours from that time, enabling jets to return home faster. That speed and accuracy ensured the wing could continue accomplishing one of its primary missions, training F-35A pilots. While facing adversity on more than one front, 33rd FW maintainers leaned forward and solved a problem that no one else could. That mindset resonates throughout the wing as Airmen work to find innovative methods to address issues before and as they arise. "I couldn't be more proud of our nomad maintainers, as this is truly innovation at its best,” said Col. David Moreland, 33rd MXG commander. “These outstanding maintenance professionals were confronted with a problem, but not constrained by it. They used adversity as an opportunity. Their efforts and this innovative solution not only saved the entire F-35 fleet thousands of hours of non-mission capable time, it had a direct impact on the warfighter by restoring combat capability around the globe." (EDITOR’S NOTE: The above US Air Force release does not include any news of note, but does reveal the surprising fact that it takes “at least 36 hours” to remove an F-35A engine – and presumably another 36 hours to replace it. This is an unheard-of amount of time, since modern aircraft are designed to facilitate maintenance by making the most frequent operations as fast, and as economical, as possible. But this is clearly not the case with the F-35, and the 72 hours required to swap its engine partly explain the lifetime operating cost of over $1 trillion estimated for the 2,700-odd F-35s that the Pentagon is expected to order. Other aircraft do not suffer from the same maintenance nightmares. 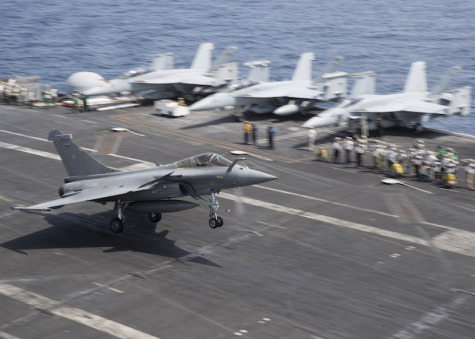 The Dassault Rafale, for example, requires just three hours to swap an engine – i.e., to remove one engine and replace it with another – or 1/24th of the time required for the F-35A.